The live chat system, enabling immediate dialogue with users seeking information and assistance on your site, is one of the channels gaining ground in companies across all sectors. Hardly surprising, considering the immediate help to customers and online users that the live chat system provides. The operator chatting with users can immediately guide them to the information needed and help them complete their transactions (which may have otherwise gone badly or been abandoned), and above all study their browsing behaviour and proactively direct them towards new products or services. 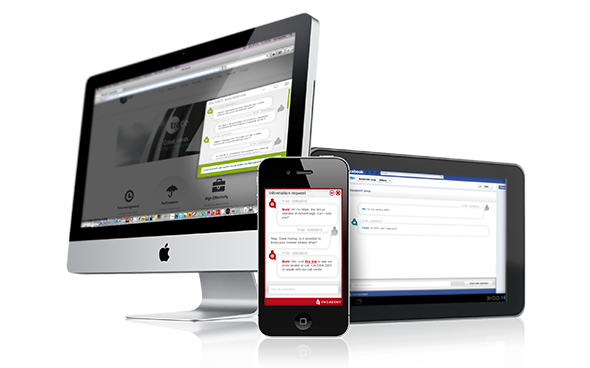 Engagent provides an online chat tool through which you can conduct a one-to-one real-time dialogue with customers browsing on your website, optimising efficiency of your Customer Care, Customer Service, and marketing and commercial activities. Using either virtual or real operators, Engagent can guide users satisfying their every need and request. Through dialogue with a virtual or human operator, Engagent provides users with wholly personalised information, links, videos, files and content, such as ad-hoc-generated forms, htmls or calls-to-action. Engage users browsing on your website, putting them at the centre of the action by dialoguing with them. Improve Customer Experience of online users and customers. Offer people the chance to meet their own needs in self-service mode. Reduce support costs with the help of virtual operators.